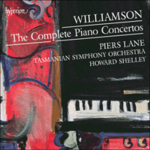 The complete piano concertos / Malcolm Williamson ; Piers Lane, Tasmanian Symphony Orchestra, Howard Shelley. Concerto no. 3 : for piano and orchestra, reduction for two pianos / Malcolm Williamson. Jun 64: featuring John Ogdon, Sydney Symphony Orchestra, Joseph Post.